Note: The Map Generator does not work on the new EVL web server (the new server is a Linux PC, while the Generator is built on a set of SGI programs). This page allows you to interactively generate VRML 2.0 scenes of topographic maps of the world. The topographic data used is the ETOPO-5 dataset from the NOAA NGDC, a 5 arc minute resolution map of topography and bathymetry for the entire Earth's surface. 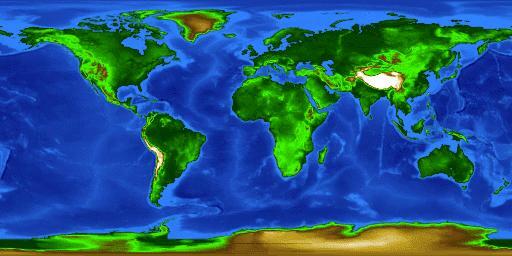 The surface can be colored based on elevation, or texture-mapped with various other data sets. The texture maps available are the biosphere, an AVHRR composite, the CIA World Data Bank, and the topography data (using a texture map will allow higher resolution coloring with a coarse grid). The primary difference between this and the original VRML 1.0 map generator is that it uses the new VRML 2 "ElevationGrid" node type. This produces significantly smaller files (1/10 or better) than in VRML 1. Use the menus and toggles below to set the size and quality of the map. To generate the VRML file, select a point on the map. The map will be centered around the point you pick; it currently will not wrap around the 180 degree line of longitude. New: Because some browsers have problems dealing with VRML created by a CGI script, I have created a new URL generating version of this page, which returns a link to the map which you can then load. If you are unable to get a map from this page, try the URL generator. The "Estimate .wrl size" button can be used before selecting a map point to get an idea of how large the file will be. This generator will reject all requests for any scene with more than 65,000 triangles, just to keep the load reasonable. Texture maps are JPEG images, except for World Data Bank textures, which are in GIF format since they're mostly line data. If the texture option is "-none-", then individual vertex colors will be used instead of a texture. If the "Compress data" option is on, the VRML file will be compressed with gzip before sending, which can save a lot of transmission time. If your VRML browser does not support gzip compression, turn this toggle off. Please send any comments or bug reports to: pape@evl.uic.edu. Why do I get a .cgi instead of .wrl? How do I get the original data, or higher resolution topographic data? Source code for etopo2mw, the program used to generate the VRML files. Last modified 3 August 2001.